There are a huge number of nut and vegetable fixed oils available to the aromatherapist, soap or lotion maker, each having their own unique, value-adding properties. To produce quality blends and formulations, use only fresh oils of high grade (such as food, cosmetic or pharmaceutical grade). Unrefined oils are a fabulous and flavoursome ingredient and well suited for food use. However, they usually have a much stronger odour, which can dominate a formulation, and, more importantly, have a much shorter shelf-life. This is fine if the end product is used quickly (as in food applications) but when it comes to cosmetic applications (lip balms, soap, lotions etc...), it is expected that the product will last longer than a food item. Refinement is simply a means of removing the free-fatty acids (that can cause the oil to become rancid rather quickly) and reducing its odour and sometimes its strong colouring. This said, holistic therapists (such as aromatherapists) may well have a preference for unrefined oils in which case, might well consider buying their fixed oils in smaller quantities to ensure freshness and to avoid having to discard oils that have become rancid before being used. Adding an anti-oxidant, such as vitamin E, can help to prevent oxidation (rancidity) and thus prolong the shelf life. Refined, cold-pressed oils are considered the best for lotion and soap makers because they can withstand oxidation and have a much lower odour. Refined oils offer the formulator some reassurance that their products are stable. To retain freshness, oils and butters should be stored in airtight containers/bottles and kept in a dry, cool and dark place. The fridge is fantastic as it maintains a constant cool temperature and a dark environment. Refrigerators may turn some oils cloudy and some can become thickened, however the oil soon returns to normal once it has returned to room temperature. Your butters can be frozen providing they are well protected and clearly labelled with the date (use within 6 months after defrosting). These are generally polyunsaturated that are fine and fluid. They are functional and add value to creams, lotions, soaps etc... Oils that are high in stearic, oleic and lauric acids are best used as your main/primary oil, these include oils such as coconut, sunflower and jojoba. Oils that are high in essential fatty acids are rather delicate and less stable but add value and 'nutrition' to a formula, such as hemp or rosehip. Nut seed oils, such as sweet almond, hazelnut and macadamia work very well in creams, lotions and soaps (up to 15%) due to their moisturising properties however, it is important to remember that some individuals are allergic to nuts so clear labelling is vital.Olive Oils Olive oils comes in many grades and can often be a source of confusion. The grade of oil identifies the point at which it was pressed. For example, extra virgin olive oil is the oil produced soon after the olive is harvested and is the oil produced from the first pressing. The oil produced from subsequent pressings are graded as follows... virgin olive oil and then grade A olive oil. Olive pomace is obtained by solvent extraction, but the solvent is removed from the final product. Butters, such as mango, cocoa and shea, are pressed out and are considered naturally occurring. However, other vegetable or nut oils do need to go through a process of hydrogenation in order to create saturated fatty acids, resulting in a product that is solid at room temperature. In a small number of cases, such as in the production of aloa butter, the end butter is produced by infusing the plant material in a solid oil such as coconut oil. 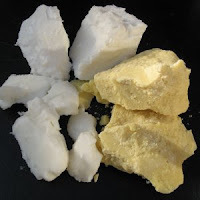 Butters are a wonderful addition to creams, lotions, soaps and other skin care products as they are excellent emollients and give hardness and solidity to the end product. Waxes obtained from plant sources are becoming increasingly more popular for natural products and are a choice ingredient for vegan products because they are an alternative to beeswax. The wax ingredients provide hardness and solidity to the finished product as well as provide a protective element to the skin. Some waxes are obtained by boiling the plant material and then skimming the surface where the wax deposits (as in carnauba wax). In other cases, the plant material undergoes a series of hydrogenation of the fatty fractions (as in olive wax - no chemicals or foreign matter is used). Although often considered an oil, jojoba is in fact a liquid wax and is extracted by simple cold-pressing. Beeswax is a combination of pollen, plant waxes and bee secretions. Beeswax is the material produced by bees to build their combs for the storage of honey, eggs and larvae. It is a hard material that has a distinct, honey-like aroma and has a melting point of around 63 degrees C. It also has a long shelf-life. Beeswax is boiled, cleaned and filtered and comes in either sheets or pellets. It has a natural yellow/brown colour but can sometimes be bleached in either sunlight or using hydrogen peroxide, producing a white beeswax. Like plant waxes, it adds hardness and solidity to end products as well as providing a protective barrier to the skin.